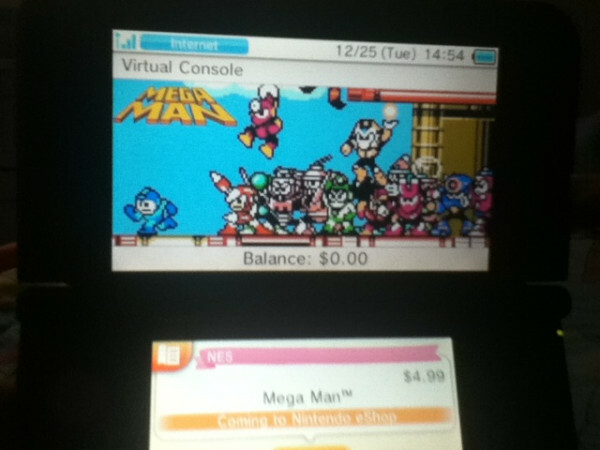 The hotly anticipated North American release of Mega Man 1 on the Nintendo 3DS eShop happened today. If you haven't done so already, you can grab it now for $4.99. And with that out of the way, you can look forward to Mega Man 2, due on February 7. Mega Man 3, Mega Man 4, and so on will follow shortly after. WHERE ARE THE ROCKMAN WORLD GAMES ? I wish the eShop graphic had more relevance to the actual game than just Bomb Man. Give me one good reason not to buy this game. Seriously, anyone? Other than the fact what I really want is Mega Man 3. Hee hee. Man, too bad 1 is the least playable. I'm all for 3, though. Oh, and 6. OMG, I might just get a 3DS for this! Dark-Black-Wings, that's not too wise buying a new console/handheld for a rerelease, especially considering the PSP (and thus the Vita) also did it. Capcom, release a "Rockman Complete Works Collection" (Plus MM7-10 and side-games), please? @Dark-Black-Wings and other anon: I assume DBW is being sarcastic? How many systems MM1 was released for? Original: NES, Wii's Virtual Console, PlayStation Network and cellphones. Mega Man 7 please, I need a better version than the anniversary collection one.